We used to make this craft in our Home Economics class in Middle School and I like to keep the tradition alive by making one each year. With the only supplies being a magazine, some spray paint and glitter it’s a fun an interesting craft that costs little to nothing to make. My mom and I ventured out to do some Black Friday shopping last weekend and I was shocked to see that several stores (anthropology, urban outfitters, etc.) were actually selling unpainted ones in their stores this year. Start out with a magazine, preferably a regular one… if you use the smaller ones stores send you around the holidays they generally won’t have enough pages to fill out your tree. Bend the pages to loosen up the spine a little bit and then go one page at a time and fold the upper right corner into the spine of the magazine. If you run into pages that have half page fliers or subscription cards, just rip them out. Once you’ve done each page, go back to the beginning and fold in one more time. This will make an oblong diamond shape with the page. Take the small triangle that’s left at the bottom and fold it up. This will be the base of the tree so make sure you fold them in line with the pages so your tree will be even all the way around. If you want to ensure they won’t pop back out you can tuck the triangle up into the page. Continue until all of the pages are folded with the bottom triangles tucked up. Now, you can start forming your tree. Once you stand it up, you’ll notice that there’s a huge gap in the back between the front and back covers. I just put a couple pieces of scotch tape and tape the covers together and then start fanning the pages out until the tree is full all the way around. You can leave the tree as is and put it out just like that, but I like to paint mine and give it a little sprinkle of glitter. Put your tree in a well ventilated area that you’re not worried about getting messy (I always use or basement) on top of some newspaper. 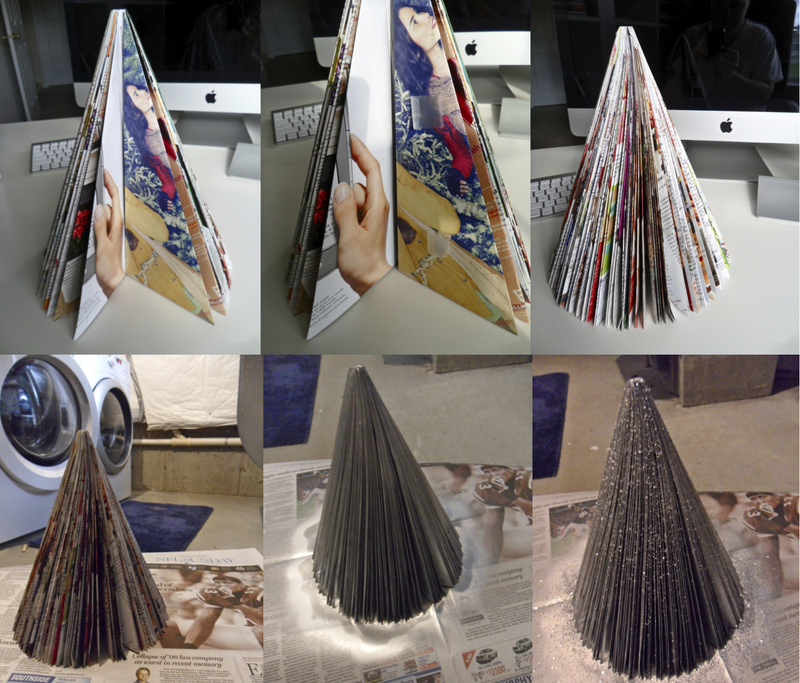 I put my news paper on top of a box that I can spin so once I start painting I don’t have to touch the tree again. Pick your spray paint, I used a silver metallic paint for this tree. Doing short quick lines spray all the way around the tree, getting in between the pages where necessary. 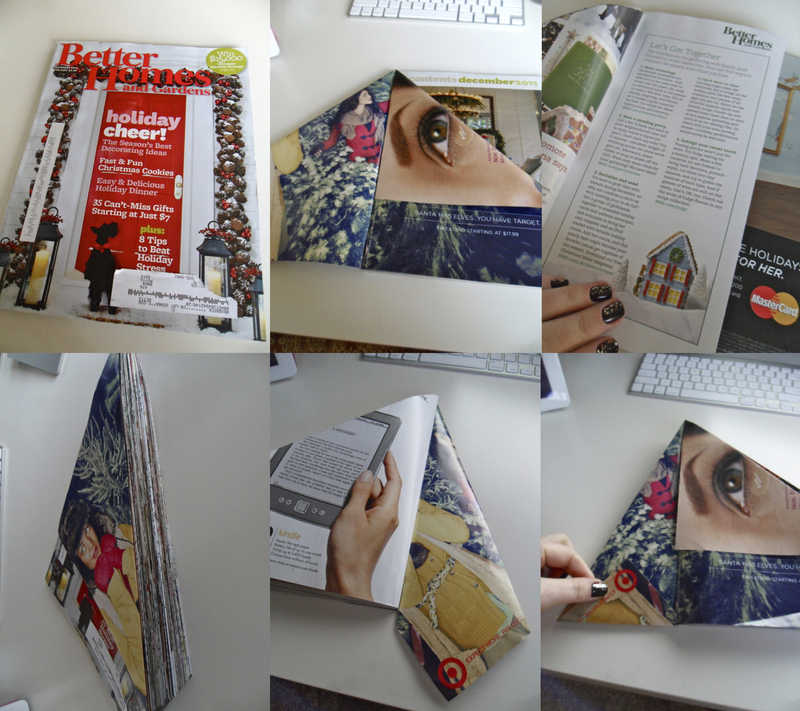 Then go around the opposite way and paint that, this will ensure that no print from the magazine will show through. Sprinkle with glitter immediately after painting, the paint will serve as the adhesive. Some times I leave the trees just like this and sometimes I add embellishments. In the gold one shown in the picture up top, I added foam glitter snowflake stickers and added a snowflake ornament to the top of the tree. I love them… especially gold and silver. how fabulous! Thanks! 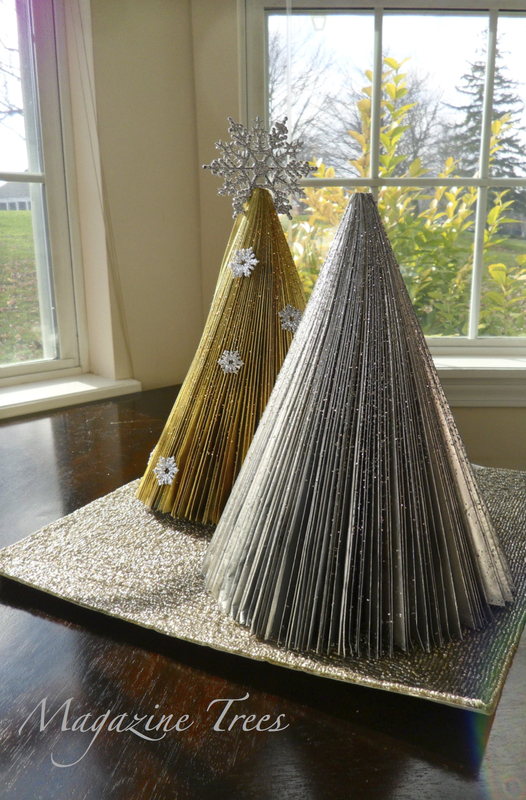 The gold one is from last year… This year I’m doing a “winter wonderland theme” for the house, all silvers and whites!